In a 3-quart pot over high heat, heat the butter and oil. Finely chop the onions and fry gently in butter until softened. Add the lamb and continue cooking and stirring for 2-3 minutes. Remove the stalks and seeds of the pepper. Add the bell peppers, tomatoes, garlic, and salt to taste, stirring to mix well. Add hot water, mix well and continue cooking and stirring for four minutes. Cover and bring to a boil. Cook for a minute or two, reduce heat to simmer, and cook, covered, for 1 hour and 10 minutes. Remove from heat. While lamb is cooking prepare the eggplant puree. Melt the butter in a small saucepan, sprinkle over the flour and stir until slightly colored. Remove from the heat. Pierce the eggplant all over with the tip of a small knife and cook over a charcoal fire or open gas flame, turning occasionally, until the skin is charred and the flesh tender. Remove the eggplant from the flame and gently tap all over the eggplant with the flat part of a knife blade. 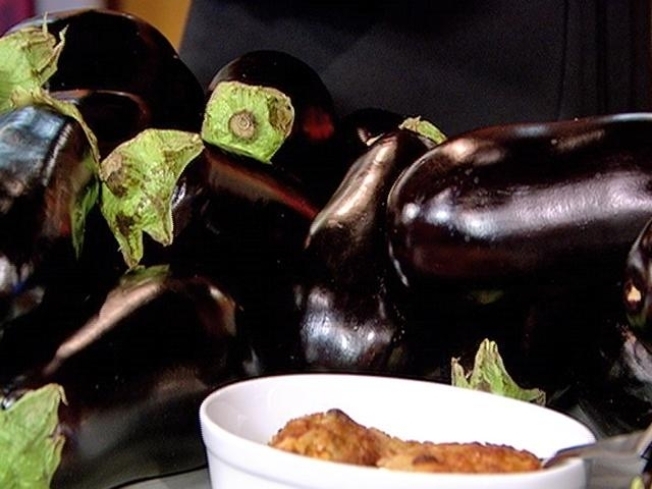 Hold the eggplant by the stems and carefully peel or slice away peel with a small sharp knife. Discard peels. Drain the excess liquid from the eggplants. In a skillet melt the butter and whisk in the flour. Continue whisking for a minute or two. This makes a roux, a thickening agent for sauces. Gradually add the warm milk and nutmeg and the grated cheese and stir well. Add the salt, whisk to mix well, and add the eggplant flesh, mashing, whisking, and cooking until everything is well blended. Pour the eggplant puree into a serving dish, make a hollow in the center and arrange the meat in this hollow with a little of its own liquid.